The udder of a cow is an organ designed to produce and offer a newborn calf easy access to its mother’s milk. It is suspended outside the wall of the rear abdomen and thus it is not restrained, supported, or protected by any skeletal structures. 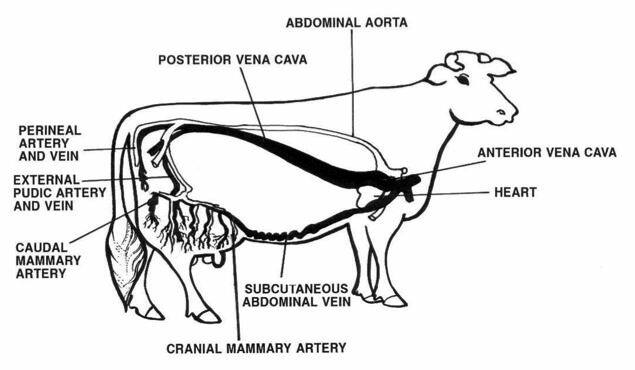 The udder of a cow is made up of four mammary glands or “quarters.” Each quarter is a functioning entity of its own which operates independently and delivers the milk through its own teat. Generally, the rear quarters are slightly more developed and produce more milk (60%) than the front quarters (40%). The udder may weigh 15-30 kg and it may hold the same weight of milk. 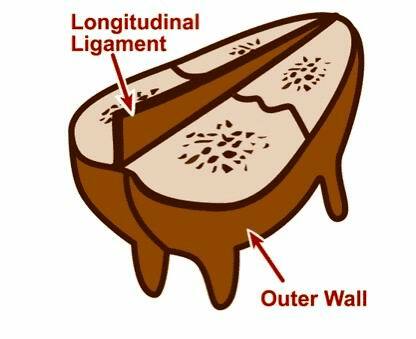 A set of ligaments and connective tissue maintain the udder close to the body wall. Strong ligaments are desirable because they help to prevent the occurrence of pendulous udder, minimize the risk of injuries, and avoid difficulties when using milking equipment. Subdivision of the udder. From: Sukolrat Boonyayatra, DVM, MS, Clinic for Ruminant, FVM, CMU. Separate quarters. From: H.D. Tyler, Iowa State University. Internal structure of the udder. From: H.D. Tyler, Iowa State University. The udder is known as an exocrine gland because milk is synthesized in specialized cells grouped in alveoli, and then is excreted outside the body through a duct system that functions like the tributaries of a river. Milk production demands a lot of nutrients that are brought to the udder by the blood. To produce 1 kg of milk, 400 to 500 kg of blood must pass through the udder. In addition, the blood carries hormones that control udder development, milk synthesis, and the regeneration of the secretory cells between lactations (during the dry period). The alveolus is a functional unit of production in which a single layer of milk secretory cells are grouped in a sphere with a hollow center. Capillary blood vessels and myoepithelial cells (muscle-like cells) surround the alveolus, and the secreted milk is found in the internal cavity (lumen). to discharge the milk into the lumen. Blood flow to and from the mammary gland. From: H.D. Tyler, Iowa State University. The milk leaves the lumen through a collecting duct. A lobule is a group of 10 to 100 alveoli drained by a common duct. Lobules are themselves organized into larger units called lobes. The lobes discharge the milk into larger collection ducts that lead to the gland cistern, which lies directly above the teat of the gland. The ducts form channels of drainage in which milk accumulates between milking. 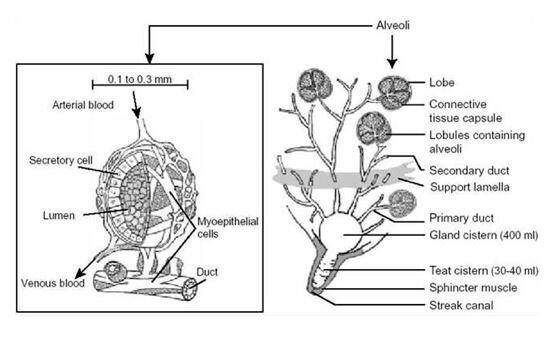 However, it is only when the myoepithelial cells that line the alveoli and the smaller ducts contract in response to the hormone oxytocin (milk let-down reflex) that milk flows into the galactophores and the gland cistern. The teat forms a passageway through which the milk can be withdrawn from the gland. It has a smooth skin covering and a rich blood and nerve supply. The teat tip closes with a smooth muscle ring or sphincter. Preservation of the normal teat structure is essential to the maintenance of the natural defence mechanism against mastitis-causing bacteria. Differences in teat structures, particularly the diameter and the length, are related to susceptibility to infection. Structure of the secretory tissue. From: Sukolrat Boonyayatra, DVM, MS, Clinic for Ruminant, FVM, CMU. Milk secretion by the secretory cells is a continuous process that involves many biochemical reactions. During milking, the rate of milk secretion is somewhat depressed, but it never stops completely. Between milkings, the accumulation of milk increases the pressure in the alveoli and slows down the rate of milk synthesis. As a result, it is recommended that high-producing cows be milked as close as possible to 12 hour intervals. More frequent ejection of milk reduces the pressure build-up in the udder, and for this reason milking three times a day can increase milk yield by 10 to 15%. Immediately prior to milking about 40-50 per cent of the total milk is held in the gland cisterns, sinuses and large ducts, while the other 50 per cent is held in small ducts and alveolar lumena. 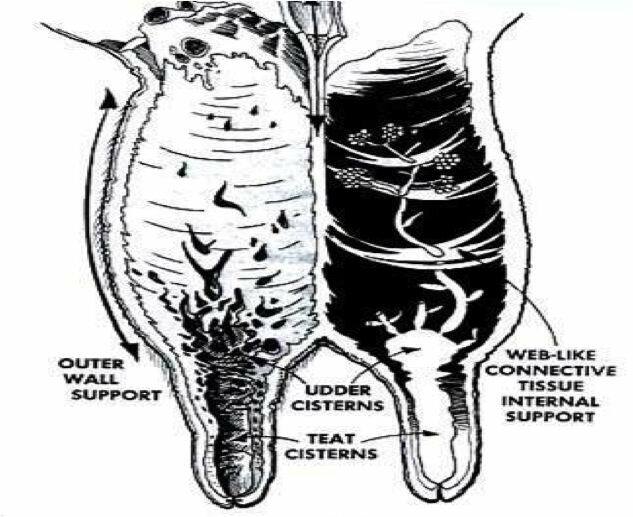 Between milkings approximately 40% of the milk is stored in the teat and gland cisterns and the major ducts while the remaining 60% is stored in the alveoli. Some milk constituents move directly, without a change in form, from blood to milk; while others must be synthesized by the epithelium. Casein and lactose, for example, are found only in milk, and milk fat comprises glyceride combinations not found elsewhere in the body. The amount of milk produced is controlled primarily by the amount of lactose (glucose + galactose) synthesized by the lactose synthase enzyme in the Golgi apparatus. Lactose secretion into the cavity of an alveolus increases the concentration of dissolved substances (osmotic pressure) relative to the other side of the secretory cells where the blood flows. As a result, the concentration of dissolved substances on each side of the secretory cells is balanced by drawing water from the blood and mixing with the other milk components found in the cavity of the alveolus. For normal milk, a balance is reached when there is 4.5 to 5% lactose in the milk. Thus lactose production acts as a “valve” that regulates the amount of water drawn into the alveoli and therefore the volume of milk produced. The caseins and the serum proteins (such as ß-lactoglobulin, and α-lactalbumin) found in the milk are synthesized from the amino acids taken up from the blood. These proteins, synthesized in the rough endoplasmic reticulum (RER), are packed in micelles before they are released in the lumen of the alveolus. The immunoglobulins are synthesized by the immune system, and these usually large proteins are drawn from the blood into the milk. The permeability of the secretory cells to immunoglobulins is high during the synthesis of colostrum, but decreases sharply with the onset of lactation. Acetate and butyrate produced in the rumen are used, in part, as the building blocks of the short-chain fatty acids found in milk. About 17-45 % of the fat in the milk is built from acetate and 8-25 % from butyrate. 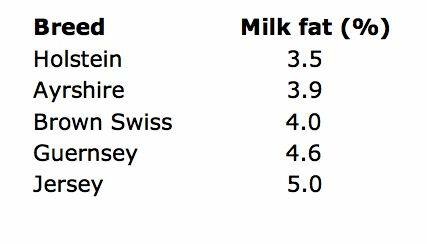 Diet composition has a strong influence on milk fat concentration. Lack of fiber depresses the formation of acetate in the rumen, which in turn results in the production of milk with a depressed concentration of fat (2-2.5 %). In general, only half the amount of fatty acids in milk fat is synthesized in the udder, the other half comes from the predominantly long-chain fatty acids found in the diet. 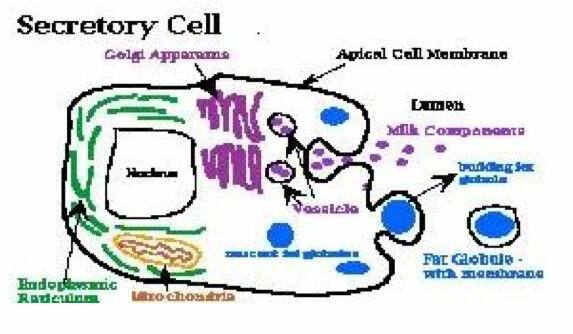 Functioning of secretory cell. From: Sukolrat Boonyayatra, DVM, MS, Clinic for Ruminant, FVM, CMU. ejection of milk from the alveolar lumen (neuro-hormonal reflex). In this phase of milking the active cooperation of the cow is not required. Nerve endings in the skin of the udder and of the teat are stimulated by washing/wiping of the udder, the slipping-on of the teat cups and by pressure of the teat liner on the walls of the teat. The teat sphincter at the tip of the teat then opens and milk begins to pass out into the milk tube. This phase, which is activated by the nerves, begins about 5 to 10 seconds after the udder and teats have been stimulated. The nervous reflex brings about a squeezing of the ducts by the smooth muscle and the milk within the ducts is pushed into the udder cisterns. Since the dairy cow has a relatively large cistern, 40 to 50% of the total milk yield may be obtained during this passive withdrawal phase. in a longitudinal (lengthwise) arrangement along the small ducts to effect a shortening and widening of these small tubes; this aids the expulsion of the milk from the collapsed alveolus by increasing the size of the passage through which the milk must pass. 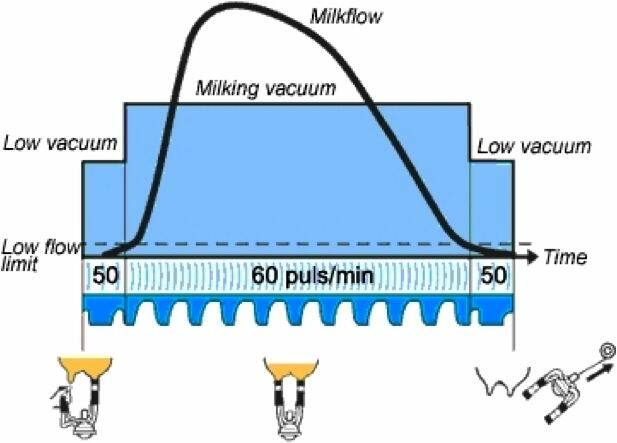 The conditioned stimuli for milk ejection include rattling of the milk buckets, washing of udders, feeding of concentrate, approach of the milker, and application of the milking machine or massage of the udder prior to application of the teat cups. These stimuli send a signal to the paraventricular nuclei of the hypothalamus and then travel to the posterior pituitary gland and causes the release of the hormone oxytocin into the blood stream. This hormone provokes the contraction of the myoepithelial cells. Neuro-hormonal reflex. From: Sukolrat Boonyayatra, DVM, MS, Clinic for Ruminant, FVM, CMU. The oxytocin effect usually takes place 20 to 40 seconds after the initial stimulation (e.g. udder wiping) and lasts for only about 6 minutes. It is most important that the milk is removed while this reflex is operating. The udder should be handled no earlier than 60-90 seconds before teat cup application, otherwise the beneficial effects of good milk ejection will be lost. Once the effect of oxytocin wears off, milk that has not been removed will flow back from the udder sinuses into the ducts. The extra pressure within the udder will reduce the synthesis of milk after the incomplete milking, and if this situation occurs repeatedly the cow will reduce her yield accordingly. In dairy cows the milk ejection reflex is probably essential for 50 to 60% of the total yield at a milking. The milk let-down reflex of cows is very easily retarded or prevented by external stimuli which disrupt the normal routine for milking. directly counteracting the effect of oxytocin on the contraction of myoepithelial cells. 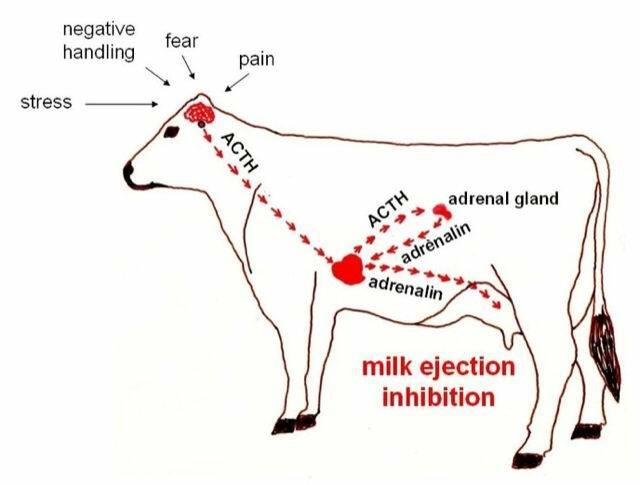 If adrenalin release occurs before the milk-ejection, the ejection will be blocked. 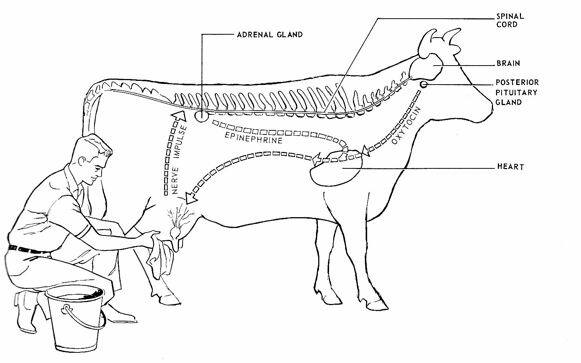 When adrenalin is released after milk ejection has commenced, it will result in large amounts of milk being retained in the udder with associated negative effects on milk yield. Cows handled gently and milked carefully at regular intervals seldom suffer from this problem. Some stimuli inhibiting milk let-down. Milk is for mammals the main nutritive source for the young while they have their greatest relative growth. Therefore the amount of milk and its composition produced by the lactating animal is very well adapted to the special needs of the young. Breed differences in dairy cattle. During pregnancy, the final development of the mammary gland occurs to prepare for milk production (lactogenesis = process by which mammary alveolar cells acquire the ability to secrete milk), which commences as the calf is born. The first milk produced is called colostrum and is particularly rich in antibodies. After calving, lactation continues for an extended period, in the dairy cow typically 300 days. Hormonal influences are critical to the maintenance of lactation. A few weeks after parturition the cow will begin her oestrus cycle again and show heat. She will be usually be artificially inseminated at an appropriate heat around 70-90 days after calving. The objective is to get the cow calving about once per year. Milk yield declines as pregnancy progresses. In fact the hormonal changes during pregnancy and the increasing flow of nutrients diverted towards the foetus serve to down regulate milk secretion. At around 300 days milking is usually stopped and the cow “dried off”. The mammary gland of the dairy cow requires a non-lactating period prior to an impending parturition in order to optimize milk production in the subsequent lactation. 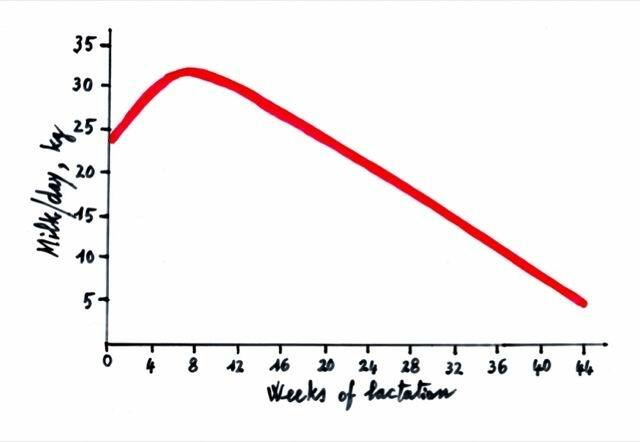 There is general agreement that an approximate 60-day non-lactating period is required and that dry periods of less than 40-50 days result in less than optimal milk yields. Dry periods longer than 60 days in length does not result in a significant increase in milk production. Long dry periods decrease the average annual production of the cow by extending the calving interval beyond the normal 13-14 month interval and causing a decrease in the lifetime production of the dairy cow. Part of the dry period effect is related to body condition of the cow at calving. Cows in good body condition at calving produce higher milk yield during the following lactation than in cows in thin body condition at calving. 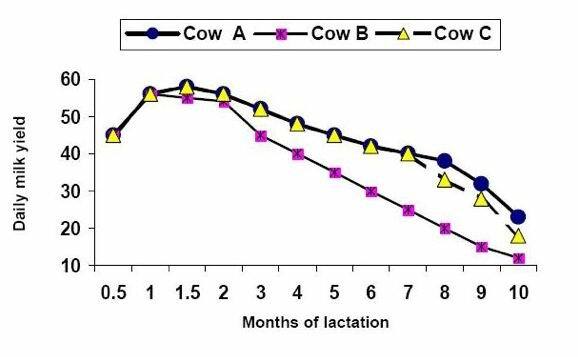 The changes in daily yield as the lactation progresses are a direct result of changing cell number and cell activity. The curve is a function of time after calving, the general level of production, the height of the peak, the rate of rise to that peak and the rate of decline from the peak. A generalized lactation curve for a high-yielding cow is shown in the next slide. The drawing shows a curve with a peak yield of about 30 kg. The lactation has a duration of about 300-310 days, which allows a dry period for mammary regeneration of 60 days and is consistent with one lactation yearly. dry period which usually lasts from 50 to 60 days. Peak yield is the point where the cow reaches the highest milk production level during the entire lactation. Heifers peak at 70-75% of mature cows and second lactation cows peak at 90% of mature cows. Normally, the peak is reached four to ten weeks after calving. The time it takes to reach peak yield varies with many factors, for example breed, nutrition and yield potential. Higher producing animals tend to peak later than low producing ones. A high peak yield normally means a higher total yield. Research shows that each one kilogram increase in peak yield usually means an additional 100-200 kg of milk produced during the actual lactation. Reaching high peak yields requires a very well managed and balanced feeding programme. Because the shape of the lactation curve is fairly constant, milk yield in the early portion of the curve can be used to predict milk yield for the entire lactation period. Analysis of lactation curve shape is helpful in identifying feeding and management problems within a dairy herd. Lactation curve of a dairy cow. The rate of decline in milk yield following peak production is commonly known as persistency. Persistency is calculated as the month’s milk divided by last month’s expressed as a percentage. 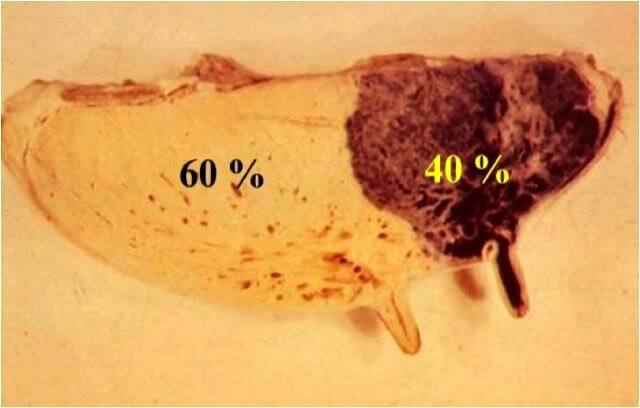 On average, the persistency should be about 94-96% (i.e. milk yield in each month is about 95% of the previous month’s yield). If a cow’s milk production falls by 7% per month after peak, it is more persistent than a cow that loses 10% per month. A general rule of thumb is that higher peak production leads to lower persistency. As for peak yield, the persistency is dependent on feeding and is therefore, to some extent, possible to influence. Persistency differs between cows, but a first lactating cow is normally more persistent than a second or third lactating cow. The amount of milk produced by the cow increases with advancing lactations (age). This is due in part to an increase in body weight, which results in a larger digestive system and a larger mammary gland for the secretion of milk. Another reason for increased milk production with age is due to the effects of recurring pregnancies and lactations. Data on milk production with cows suggest that 20% of the increase in milk production is due to increased body weight and 80% to the effects of recurring pregnancy and lactations. Recurring pregnancies and lactation can result in increases of 30% in milk production from the first to the fifth lactation. Pregnancy has an inhibitory effect on milk yield. Most of the reduction in milk yield occurs after the fifth month of pregnancy. By the 8th month of pregnancy, milk yield may be 20% less for that month compared with a non-pregnant cow. The inhibitory effect of pregnancy is not likely due to fetal requirement, which does not increase considerably until the last two months of pregnancy. It is believed that the increase in estrogen and progesterone levels as pregnancy progresses, inhibits milk secretion. Milk production increases with lactation number and is maximized in the fourth or the fifth lactation. This is a result of the increasing development and size of the udder and the increasing body size over that of the first lactation animal. The expected mature yield (mature equivalent) of a primiparous cow calving at two years of age can be estimated by multiplying yield of first lactation by 1.3. Cows calving in late fall to spring produce more milk (up to 8% more) than cows calving in the summer. This is likely due to an interaction between day light and ambient temperature. Seasonal differences have become less significant because of better feeding and management of the dairy cow. The effect of ambient temperature on milk yield is dependent upon the breed. Holsteins and the other larger breeds are more tolerant to lower temperatures, whereas the smaller breeds particularly the Jersey, are much more tolerant to high temperatures. The optimum temperature for the Holstein cow is about 10 °C. Milk production declines when the environmental temperature exceeds 27 °C. The reduction in milk yield is largely due to a drop in feed intake. High temperature affect high producing cows more than low producers and it is particularly harmful during the peak of lactation. 3) less negative feedback on the secretory cells due to the accumulation of milk components. The practice has been implemented to increase milk yield and utilize facilities more efficiently. However, the practice is still being debated. There are several problems associated with 3 x per day milking. It may increase the incidence of mastitis as the cows get exposed to the milking machine more often. The practice is also not recommended for poorly managed herds as existing problems will be aggravated. Cows are usually milked at equal intervals (12-h interval for 2 x milking). Cows milked at unequal intervals produce less milk than those milked at equal intervals. The reduction in milk yield is more in high producing cows than in low producing ones. Residual milk can be defined as the amount of milk left in the udder after milking is completed. About 10-20% of total milk is left in the udder as residual milk. Residual milk can be measured by giving the cow oxytocin and one minute later, milking the cow again. Part of the residual can never be recovered by conventional milking procedures while another fraction can be collected if the amount of residual milk is large due to poor milking procedure. This portion of milk is referred to as available milk. Available milk reflects how well the cow was stimulated for milking. If the cow is not well trained for milking, the amount of available milk uncollected will be great. Large amounts of residual milk reduce daily milk production, reduce lactation production and the cow will have fewer days in milk. Close monitoring and evaluation of each cow or group are important ingredients when trying to reach a high level of total milk production (high peak and long persistency). However, the milk yield differs from day to day and the relative variation can be as high as 6-8 % from one day to another. Cows milked three times or more a day usually have a lower variation than cows milked twice a day. The total milk yield is a good indicator of gross income from milk sales, which has a direct effect on the dairy farms income. With milk yield recording, the dairy farmer can monitor his day to day output and use it to control and monitor the production. Milk yields are also the most interesting variable when calculating the feed rations. Monthly recording is usually carried out by a milk yield recording organisation and was originally introduced for breeding purposes. Due to the fact that the recording normally takes place once a month, and each cows milk production varies from day to day, it is not recommended to use this information to manage feeding. When receiving the data, it will be historical and not reflect the current situation. However, the information can be used for trend analysis and give an idea of the peak and persistency for individual cows, which can be used for culling, breeding and general feeding decisions. Daily milk yield recording can be considered as one of the most important decision aids for fine tuning the high producing herd. The milk yield can be measured at every milking by using either recorder jars or milk meters. If using recorder jars, all data has to be recorded manually (e.g. on paper or typed into a computer).